The Comfort Products Ten Motor Massage Cushion with Heat therapy can definitely bring stress out of the picture at home, in the office and even in your car for a very long time. This back massage cushion offers different massage actions for the body’s critical areas. You can take it pretty much anywhere as it can be attached to most chairs. Use it anywhere but still feel relaxed and tension-free after every use. 10 motors which offers 5 different massage actions for the neck, lumbar region, mid back, upper back and thighs. It can provide heat for your back with or without giving you a massage. The heat it provides doesn’t go higher not unless pressure is applied to the cushion which is good for safety reasons. It comes with a control wand complete with a backlit LCD screen for portability. It can fit even into a side pocket. It has a tapping massage as well as sequencing motors for running it either up & down or in wave & random patterns. It also has an “all-motors-on” mode which means, you can set it to run at two speeds and at two intensities. Its timer can be set for about 10 to 30 minutes. It comes with an AC adapter and an automobile lighter w/ DC adapter so that you can just plug its cushion onto a wall socket. It has adjustable straps for holding the user snugly on the seat. It is filled with soft foam and additional pads for both the neck as well as the lumbar region) for extra comfort. It has a stimulated black suede cover which can be easily cleaned using a damp sponge. It comes with a 3-year warranty against defects so you can get plenty of use with peace of mind. The Comfort Products Back Massage Cushion is not like any average massage cushion that you might come across. 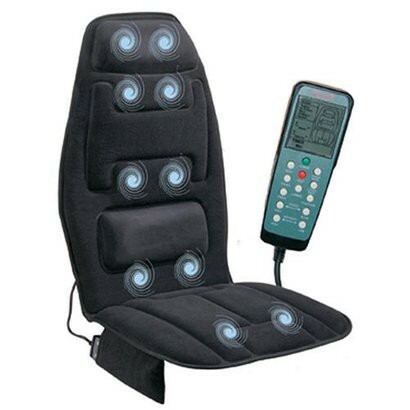 Its ten motor massage feature makes it very enticing among home owners. Imagine all those long, tiring days at work with only the thought of taking a long, relaxing vacation probably a t some deserted island off the coast to get you going. With this massage cushion, you don’t need to wait for your vacation leave to come, you can go through all your work load and come home to a relaxing massage cushion while sipping your favorite tea, watching your favorite TV series or even while chatting with your friends on Facebook. Then, imagine all those sleepless nights from sore muscles and back pains drifting away. With this cushion, even homemakers can pamper themselves after a busy day of cleaning and doing chores. The Comfort Products Ten Motor Massage Cushion is a must-have for every homeowner. Its soothing heat treatment, memory foam and massage motors make it the ideal tool to relax and unwind after all the stressful moments at work and in the field. Aside from being user friendly with its hand held electronic controller, it is also easy to store because of its side pouch. Whether you want to use it at home, in the office or in your car, it already comes with AC & DC adapters for your convenience. If you are worried it won’t fit snugly since you are slim, petite or otherwise; there is no need to fret because it has adjustable straps! All these and more make this back massage cushion reviews the ideal relaxation tool to come home to.